Blepharitis is an inflammation of the eyelid, along the eyelash line. The condition is not fully understood by doctors, but there are several causes associated with blepharitis as well as a range of treatments. Viruses, bacteria, mites and problems in the oil glands of the eye are all linked to blepharitis. Certain kinds of medication such as those used for severe cases of acne can also cause blepharitis. Blepharitis is not conjunctivitis, or “pink eye”, although the two may occur at the same time and display similar symptoms. • Anterior blepharitis: There are many kinds of anterior blepharitis. Anterior blepharitis is the name of an inflammation that affects the outside part of the eyelid around the base of the eyelashes. Bacteria, mites and viruses can all cause anterior blepharitis. There are also a few different kinds of posterior blepharitis. Posterior blepharitis refers to blepharitis of the eyelid at the point where it comes into contact with the eyeball. Three kinds of anterior blepharitis are staphylococcal blepharitis, demodex blepharitis and seborrheic blepharitis. This inflammation is caused by the bacteria Staphylococcal growing along the eyelash line. Mites and their waste can clog the roots of the hair follicles of the eyelashes. Everyone has tiny mites that live in their eyelashes, but only some people experience an infection. Researchers speculate that an unusual immune response or allergies might cause some people to be affected by demodex blepharitis and not others. A different kind of demodex mite can cause posterior blepharitis when the mites enter the oil glands of the eye. This type of blepharitis is caused by seborrheic dermatitis, which is a skin condition characterized by flaking and scaling of the skin. The oil glands in the eye are called the meibomian glands. These glands sit behind the eyelashes and are responsible for giving the skin around the eyes a healthy amount of lubrication. When these glands don’t function properly, meibomian blepharitis can occur. • Rosacea blepharitis:Rosacea is associated with dysfunction of the meibomian glands as well, resulting in inflammation of the eyelid. Each kind of blepharitis has its own set of symptoms and treatment. 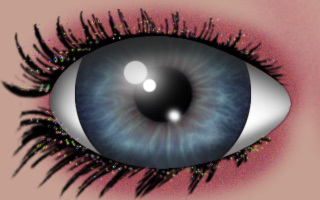 Symptoms are the sensation of a foreign body in the eye, matted eyelashes and loose eyelashes. In staphylococcal blepharitis, a ring can be seen around the shaft of the eyelash. Treatments include a short course of steroids, a four to six week antibiotics course and fluidic acid. If staphylococcal blepharitis is left untreated, serious complications may occur. Symptoms are the sensation of a foreign body in the eye, dandruff flakes at the base of the eyelashes, itching eyelids and eyebrows. Treatments include an anti-parasitic ointment, a tea tree scrub applied at the base of the eyelashes and a tea tree oil massage along the lash line. Rosacea is a risk factor for demodex blepharitis. Symptoms are itching, burning and flaking along the eyelash line. Treatment depends on the type of seborrheic dermatitis that is causing the blepharitis. Washing the eyelash line, using warm compresses and antibiotic eye drops are common treatments. as well as burning and a sensation of a foreign body in the eye. Treatments include eye hygiene, eye drops, heat, medicine to increase oil productions in the meibomian glands and increased consumption of Omega-3 fatty acids. Symptoms are itching, burning, redness, scaling or crusting of the eyelid and irritation. Treatments include eye hygiene, eye drops, artificial tears, heat and increased hydration by drinking more water daily. A diagnosis of blepharitis can be made during a complete eye exam. Observation of the condition of the eyelid and eyelash line should be enough to make a diagnosis. Patients who wear contacts may have to temporarily discontinue their use of the lenses until the inflammation goes away. If a patient used any eye makeup products while they were experiencing blepharitis, the products should be thrown away in case they were contaminated. Warm compresses can help with the symptoms of blepharitis. Soaking a washcloth in warm water and leaving it across the eyelids for five minutes can loosen any crustiness that builds up at the base of the eyelashes and loosen any debris clogging the oil glands. You can gently massage the eyelids as well. Always be very careful when touching your eyes and be sure not to put too much pressure on your eyeball. Using a Q-tip to clean the eyelash line with a diluted baby shampoo or another mild soap can also relieve the symptoms of blepharitis. Blepharitis can re-occur in patients over their lifetime. Employing the preventative measures below can help ward off a reoccurrence of blepharitis. Strict eye hygiene helps prevent blepharitis. Using clean towels and making sure your hands are clean before touching your eyes and eye area are important steps in prevention. If you wear makeup, it is important to thoroughly remove any traces of it before going to bed. In cases of posterior blepharitis where the oil glands are not producing enough oil, nutritional supplements of Omega-3 fatty acids may be recommended by your doctor. Flaxseed oil is a common fatty acid supplement. If you experience any of the common blepharitis symptoms, it is time to make an appointment with your eye care professional. Blepharitis can cause itching in the eye, redness, crustiness at the base of the lash line and general irritation. You may also feel a foreign body sensation in the eye. This can feel like a piece of sand in the eye or grittiness on the eyeball that doesn’t go away. In some cases of blepharitis, the eyes may become more sensitive to light.